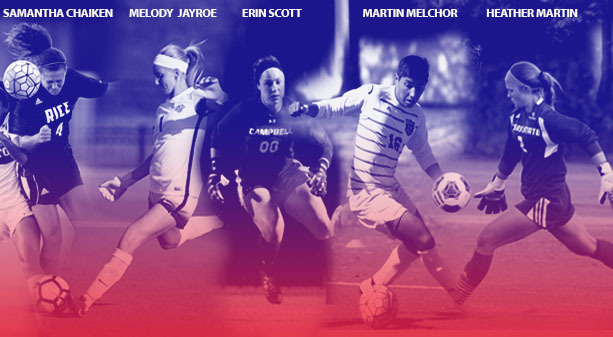 FRISCO, Texas (Oct. 18, 2017) - Former North Texas Soccer players Samantha Chaiken (Rice), Melody Jayroe (Liberty), Heather Martin (Texas State), Martin Melchor (Coastal Carolina) and Erin Scott (Campbell) received player of the week honors in their respective NCAA Division I Conferences. Chaiken received her fourth Conference USA Offensive Player of the Week selection this season after scoring two goals and adding an assist in Rice’s 4-2 win over Middle Tennessee. The senior midfielder was selected as the 2016 Conference USA Midfielder of the Year and is currently tied for first in points in conference place with 15. The Dallas native played club soccer for Dallas Texans, where she twice won the North Texas State Cup. Chaiken also competed in the US Youth Soccer Southern Regional Premier League (SRPL) West and played in the North Texas Olympic Development Program (ODP) from 2009-10. Jayroe received her second Big South Freshman of the Week accolade after earning two shutouts this week. Jayroe earned her fourth straight shutout by recording nine saves in a double-overtime win over Charleston Southern as Liberty remains undefeated in conference play. The Plano, Texas native is a former North Texas ODP player, SRPL West competitor and 2016 North Texas State Cup semifinalist with FC Dallas. Martin earned her fourth Sun Belt Defensive Player of the Week accolade after earning her seventh and eighth victories while occupying the posts for Texas State. Martin tied a school record by recording her fifth consecutive shutout in a 3-0 win over Louisiana Monroe before making eight saves in a 3-2 win over Little Rock. Martin also became the eighth Texas State player to reach 100 saves and currently leads the Sun Belt Conference in Goals Against Average in conference play. Martin won the 2010 North Texas State Cup with FC Dallas and competed in the 2011 SRPL West season. Melchor was named Sun Belt Offensive Player of the Week courtesy of a hat-trick in a 5-2 win against Old Dominion. The goals give the senior forward 16 goals and 41 total points in his career. The Jacksonville, Texas native played his youth soccer for Jacksonville Flash and FC Dallas. Melchor is a former North Texas Soccer and US Youth Soccer Region III ODP player and reached the semifinals of the 2015 Region III Championships after reaching the finals of the North Texas State Cup with FC Dallas. Scott recorded 11 saves and a pair of shutouts against Charleston Southern and Gardner-Webb en route to being named Big South Defensive Player of the Week. The junior keeper posted a season-high eight saves in the 5-0 win over Charleston Southern. The Sachse, Texas native participated in North Texas ODP in 2010 and competed in the SRPL and multiple North Texas State Cups with FC Dallas.